These stylish apartments are located in central Barcelona, just on the corner of the prestigious Passeig de Gràcia Boulevard. They have free Wi-Fi, a flat-screen TV and a private balcony. These air-conditioned Vintage Rentals apartments feature parquet floors and modern décor. The kitchen includes an electric hob, microwave, washing machine and dishwasher. You can walk to Diagonal Metro Station in 3 minutes from the apartments. Gaudí’s famous La Pedrera is 5 minutes’ walk from The Vintage Rentals, and Casa Batlló is a 10-minute walk away. 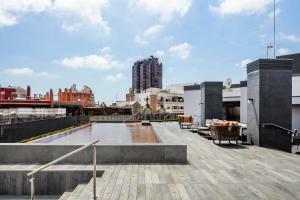 The property offers a shuttle service to Barcelona Airport, located 25 minutes’ drive away. When would you like to stay at The Vintage Rentals ? Please inform The Vintage Rentals in advance of your expected arrival time. You can use the Special Requests box when booking, or contact the property directly with the contact details provided in your confirmation.A damage deposit of EUR 500 is required on arrival. This will be collected by credit card. You should be reimbursed on check-out. Your deposit will be refunded in full via credit card, subject to an inspection of the property. This property will not accommodate hen, stag or similar parties. Please note that arrivals between 21:00 and 23:00 carry an extra charge of EUR 30. Arrivals after 23:00 carry an extra charge of EUR 50. If you expect to arrive outside reception opening hours, please inform The Vintage Rentals in advance. Change of bed linen and towels takes place once per stay. More changes are available on request. All extra services or requests are subject to availability and confirmation from the property. Each day we'll check prices and send you an email for your selected dates at The Vintage Rentals. If you don't have specific dates but would like to check prices for say next weekend or say next month we can check the price too. Click to write a review and share your experience of The Vintage Rentals with other travellers.